Hydrophilic Regenerated Cellulose filter membranes are compatible with a very broad range of aqueous and mixed-organic solutions, making them one of the most universal filter materials used prior to chromatography. 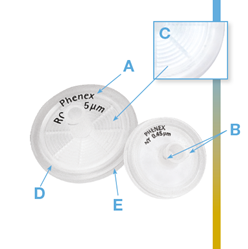 Phenex-RC filters also exhibit fast-flow and ultra-low protein and non-specific binding characteristics. Due to the beneficial material characteristics, Phenex-RC membranes are broadly recommended as an excellent general purpose/high-performance sample filter for most applications.